Memorial Day has come and gone and while I focused my attention on the meaning of this day (on my other blog, The Veteran’s Collection), I wasn’t overlooking the men who set aside their gloves and spikes and ultimately lost their lives in the service of our country, in doing so. According to Gary Bedingfield’s research of baseball players (see his two sites: Baseball in Wartime and Baseball’s Greatest Sacrifice) who served during the second world war, more than 400 major leaguers and 4,000 minor leaguers stepped away from the game to serve their country. 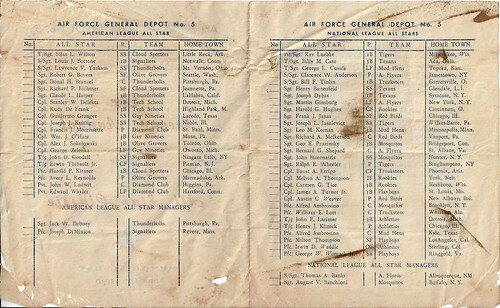 Of those, two major league players were killed in action during WWII along with 116 other professional ball players (who lost their lives as a result of combat) with still more who died while serving (non-combat-related deaths). One ballplayer in particular has held my attention since I first learned about him in Gary’s book, Baseball’s Dead of World War II. My first passion for sports began as a youth and my earliest memories began with T-ball in my local park league. I began watching baseball on television and became aware of the local minor league team (which, at that time, was affiliated with the Chicago Cubs). As I grew and got more immersed in the game, I remember seeing a few minor league games and seeing that team’s affiliation change through the years to the Twins, Yankees and Indians before beginning a long-term connection with the Athletics. The longtime Pacific Coast League Tacoma franchise drew on local baseball history when it changed its name to become the Tacoma Tigers*. I first learned about third baseman Ernie Raimondi (from Bedingfield’s Baseball’s Dead of WWII book) and his time with the local ballclub several years ago. The 16-year-old Raimondi was signed by and played for the San Francisco Seals of the Pacific Coast League (which, at the time was nearly rivaling the American and National Leagues in popularity and attendance) in 1936. In the 14 games with the Seals that season, Ernie had 14 putouts, eight assists and committed three errors while at third; he made 38 plate appearances batting .263 (nine singles and one double) which wasn’t a bad showing for a high school-aged kid, playing at the highest minor league level. Manager Lefty O’Doul wanted Raimondi to gain experience and to hone his craft and sent him to the Tacoma Tigers for the entire 1937 season. Third baseman, Ernie Raimondi (front row, second from left) with the 1938 Tacoma Tigers (source: Tacoma Public Library). The move north was beneficial to Raimondi for both fielding and hitting which carried him through into the 1938 season before being recalled to San Francisco. Ernie Raimondi’s tenure with the Tigers was favorable and landed him back with the Seals to finish out the ’38 season. Ernie’s career would fade in the following years and he would be out of baseball in 1941. He was drafted in April of 1944 and entered service on the eve of the D-Day landings at Normandy. He would see his share of combat service (with the 324th Infantry Regiment of the 44th Infantry Division) from the time he arrived in the European Theater and 218 days after his Army infantry career began, he was mortally wounded on January 9, 1945 and would fight for his life for 17 days until he would succumb. Private Ernie Raimondi in 1939 with the San Francisco Seals between Brooks Holder (at left) and Dom DiMaggio. 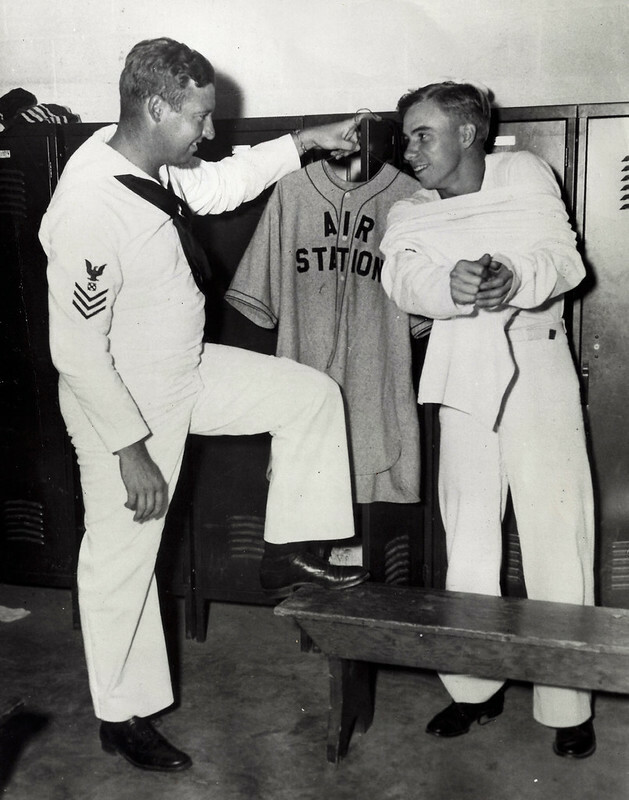 Private Ernie Raimondi’s baseball career was short and his time with the Tigers was very brief. For a military baseball collector, locating anything from his time in Tacoma has proved to be an impossible venture. The closest that I’ve come is when I acquired an original 1939 Associated Press photo of Raimondi along with fellow Seals and WWII veteran Dom DiMaggio (and Brooks Holder) with bats crossed.